I was so happy to see the following post on the Wine Pairing Weekend Facebook page: “Invitation: Let’s Talk Scorched Terroir — and Volcanic Wines — for #winePW ”. The invitation for the September Wine Pairing Weekend came from Camilla Mann, who blogs at Culinary Adventures with Camilla. As host for the month’s pairing, she chose the theme for the pairing. Two wine regions immediately spring to mind when I think of volcanic terroir: Etna DOC and Aglianico del Vulture DOCG. Both are Italian. The first is located in Sicily, in the volcanic soils of Mount Etna. 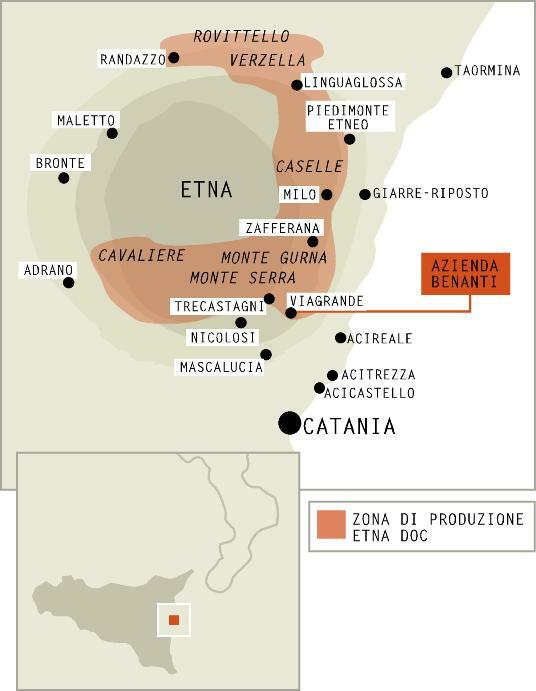 Etna DOC, and Sicilian wines in general, are much in the press these days, because of the increasing quality of wines produced there. Aglianico del Vulture is located near Mount Vulture in Basilicata (think the ankle of Italy’s boot). The Aglianico del Vulture DOC, situated in the volcanic soils of Mount Vulture, earned DOC designation in 1971. DOCG status followed in 2011 and it remains the only DOCG designated in Basilicata. The wines from this DOCG are tannic and flavorful. I am a big fan of the style and the variety, Aglianico. 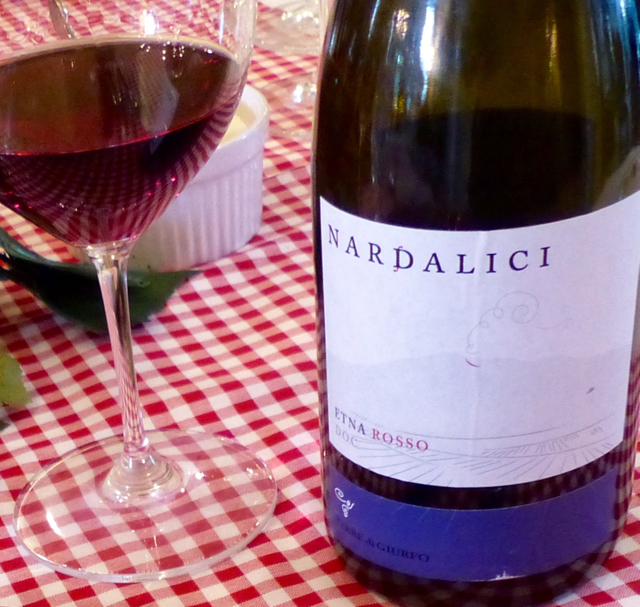 It was a difficult choice, but ultimately, we chose a wine from Sicily: 2012 Terre di Giurfo Nardalici Etna Rosso. With our wine choice made, we moved on to the food. 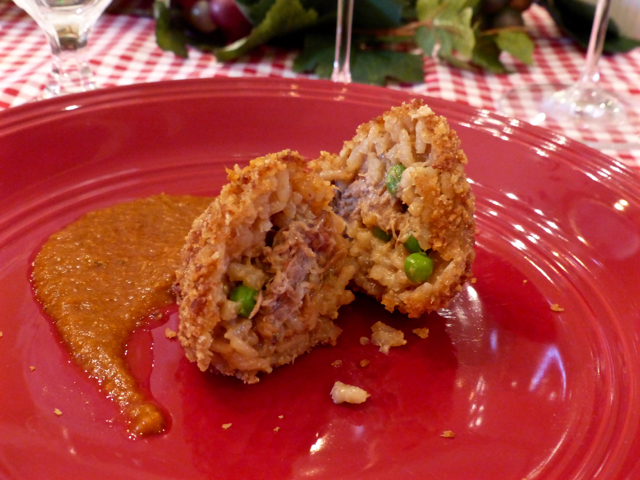 I have been curious for some time about arancini — most often described as stuffed rice balls. Arancini are very popular in Sicily, but are also served in other regions of Italy. The name, arancini, derives from arancina, which means “little orange” in Italian. Little oranges are what they look like after they have been deep fried. During my research I found a recipe for Inspector Montalbano’s Arancini. I was curious about the name and soon realized the name comes from a series of books written by Andrea Camilleri. Inspector Montalbano is Camilleri’s fictional Sicilian police detective and the recipe comes from one of the books. The story behind the recipe made it too good to pass up. Inspector Montalbano’s Arancini was our food choice. This wine is a blend of 85% Nerello Mascalese and 15% Nerello Cappuccio. By law an Etna Rosso DOC wine must be composed of at least 80% Nerello Mascalese, not more than 20% Nerello Cappuccio and up to 10% other non-aromatic grapes, including white. Mount Etna is situated along the eastern coast of Sicily and the Etna DOC (Denominazione di origine controllata) wraps around the volcano’s base to the south, east and north. The climate within the DOC is variable, depending on elevation and orientation; elevation varies between just over 1400 feet above sea level to just over 3600 feet. Winters are generally cold. Weather is mostly warm and dry during summer, with cool nights thanks to the elevation. The volcanic soils of the Etna DOC are rich in minerals including copper, magnesium, iron and phosphorous. The recipe for Inspector Montalbano’s Arancini, from the blog Culinaria Italia – Italian Food and Cooking, required a bit of math before we could even make our shopping list; we needed to convert all measurements from metric. The recipe was fairly time consuming so Pete and I divided the preparation and it worked out very well. We started by preparing the ragù which required sautéed onion, celery, pork and beef all seasoned with salt and pepper. The recipe then called for passata and tomato purée. Instead, we substituted diced tomatoes. The mixture simmered on low for several hours and I added fresh parsley and basil toward the end. Once the mixture was cool, we removed the meat, chopped it and set it aside. We then puréed the sauce until the texture was smooth. While the ragù was cooking, I diced the spicy salami, then began making the risotto. When the risotto was cooked I added a bit of the sauce from the ragù and put the mixture in the refrigerator to cool. The recipe called for two eggs to be added to the risotto mixture but, we we decided to omit this step because we were not certain the mixture would be completely cooked during deep frying. Pete cooked the peas and prepared a béchamel sauce during the time I cooked the risotto and when the risotto was cooled we were ready to assemble the arancini. I added enough of the ragù cooking sauce and the béchamel sauce to the meat mixture to allow the peas to be blended into the meat. 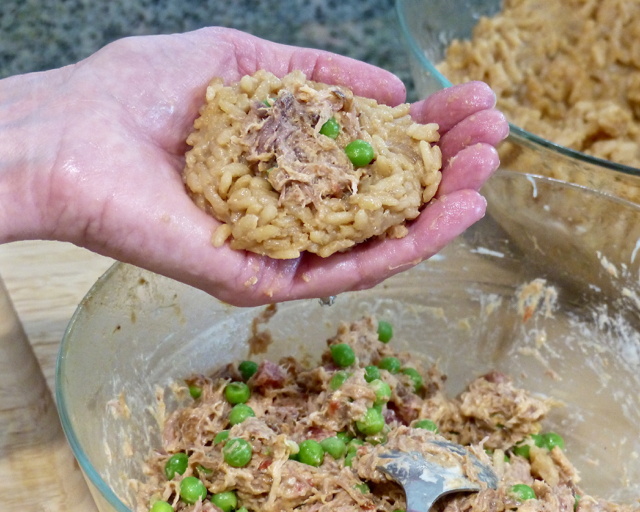 I then placed enough risotto in the palm of my hand to cover it, added a teaspoon of the filling and enough risotto to cover the filling. I then formed the mixture into a ball. Then, because I read that Adelina, Inspector Montalbano’s housekeeper, always made her arancini in a cone shape, I reshaped them into little cones (well, maybe little is the wrong word). The arancini then went into the refrigerator for an hour or so. The final step in the preparation required quick dip in egg and then bread crumbs before deep frying in olive oil. These delightful little arancini were a lot of work, but so worth it! The outside was crunchy, the risotto was moist and soft and the ragù filling was full of flavor. The meaty goodness of the filling contrasted with the peas and the spiciness of the diced salami. The creamy béchamel aded a buttery richness to the filling. We put a little bit of the sauce beside each arancini, just in case they were too dry on their own. They weren’t, but the sauce was just another layer of flavor that was a delicious addition. These two played very well together. 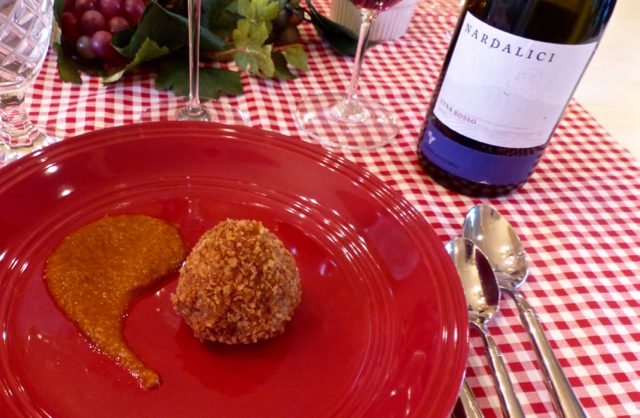 The earthy, leathery, dark fruit flavors of the Nardalici Etna Rosso paired beautifully with meaty, creamy, spicy flavors of the arancini. The grip of the tannins was somewhat reduced and the flavors of both matched well with each other. The combination brought out the dark fruit flavors of the wine somewhat. 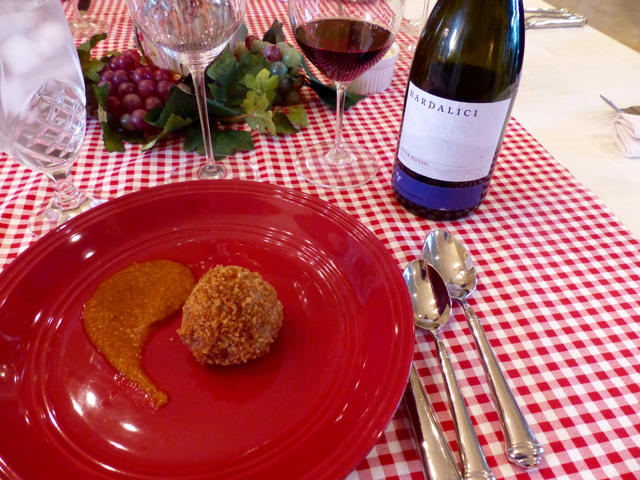 We served the arancini and Etna Rosso pairing as the secondo (second course) of an Italian dinner with friends. Our other friends prepared the courses before and after it — everything was delicious! A few nights later we prepared the remainder of the arancini and served them with a green salad and another Sicilian red wine. The combination worked just fine as a main course too. I have read that arancini are made with a variety of fillings and cheese around Sicily. We are leaving for Sicily very shortly and after my first taste of arancini, I am looking forward to sampling them throughout the island. I am also looking forward to a little airplane reading and getting to know Inspector Montalbano and his housekeeper, Adelina. Maybe I will even discover some new recipes! Thanks to Camilla for hosting and choosing such a fun and interesting theme for this month’s wine pairing weekend. To see what the rest of the Wine Pairing Weekend crowd cooked up this month, read their blog posts listed below. #winePW Twitter Chat September 12, 8 a.m. PT: Connect with us on twitter, using hashtag #winePW. We’ll chat for an hour about volcanic wines, food pairings, and #scorchedterroir. The arancini I made earlier this year wasn’t as complex, but yours sounds wonderful! Love that you tried them again with another wine the next night. When are you headed to Sicily? Enjoy your wonderful trip and you’ll have to update me on all the wonderful wines you find. Thanks Jennifer. We are in Sicily now, and having fun tasting arancini whenever we can. There are lots of versions to choose from. As you mention, Etna wine has been wonderful so far. Cheers! Nom, nom, nom. Great looking dish Nancy. It looks amazing. As does your pairing! Well done! Nom, nom, nom! Your Arancini looks fabulous Nancy. And I know it was great pairing with your Etna wine. Well done! Nancy, Wow, I’m so impressed you took on Arancini. It just seems like so much work! As you can tell, I’m a big Etna wine fan, so good choice there, too. I love Arancini, but not all the work that goes into them – I am usually lazy and wait until I have leftover risotto to make them. I’m glad you enjoyed the recipe. They look delicious! May I suggest a Primitivo di Manduria as a pairing? https://en.wikipedia.org/wiki/Manduria. Hello DJ. I was so happy to find your recipe. The recipes on your website are a great resource, thanks for sharing them. Yes, we needed to fit the arancini into a dinner that was a group effort, so that’s just where they ended up. Next time I serve them I will try to do so in the proper order. 😉 Thanks for the wine recommendation. Cheers! Thanks, Lori. I look forward to reading your post! Cheers. Those ingredients going into your homemade ragu made my mouth water. I will bet your house smelled delicious!! I didn’t know that the amounts of varietals were regulated by law in Italy. That is very interesting. Thanks for sharing. You are so right, Wendy. The house did smell delicious, always a benefit of a long, slow cooking method. Cheers, Wendy!